If you have a friend or family member who deals with hearing loss, you have probably been with them in social situations where you can hear things that they are having difficulty with. If you are both in a conversation with friends and your loved one doesn’t catch a joke or question, many people race to fill the gap by speaking for their loved one or explaining their loved one’s hearing loss to others. Although this might be the quickest way to move a conversation along, it can also leave your friend or family member out of the loop. Really advocating for people with hearing loss involves understanding their perspective and what they need to feel empowered in a situation. The first step in understanding how to advocate for your loved one is to ask them what they would like. The way people approach their hearing loss varies from individual to individual, as does how they would like to be treated. What works for perfectly for somebody may seem “off” to someone else, so always check in with your loved one. Never forget that the person you are advocating for has their own autonomy. If they have lived with hearing loss for a while, they will have developed their own ways of handling social situations. Ask your friend or family member directly how you should handle incidents where you can hear something they miss, and if there are things they would like you to avoid. For some people, it may be a relief to have you answer a question for them, especially to help them keep up with small talk. 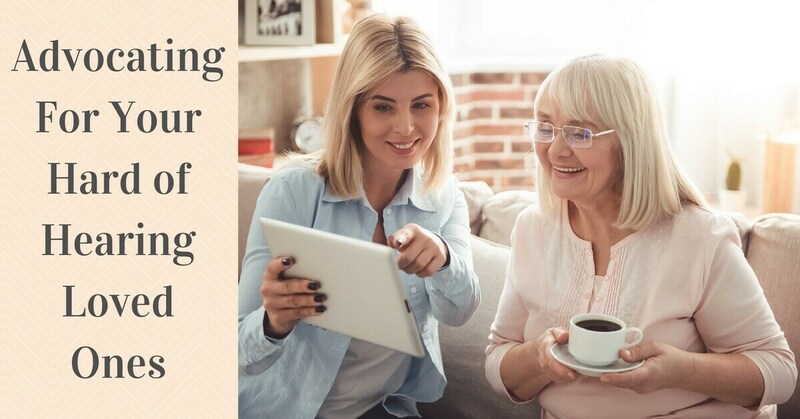 For other people, it may seem more natural to introduce a method of assisting them with the conversation – strategies like moving a conversation to a quieter area, or making comprehension easier by incorporating writing, texting or an assistive device. When you have a loved one with hearing loss, you may need to make some adjustments to accommodate their hearing. Usually with simple adjustments, a conversation can proceed, and it can be richer for both of you. Don’t be afraid to advocate for a friend with hearing loss. Understand when they will appreciate your advocacy. Often, if your loved one uses hearing aids or other assistive devices, keeping up with a conversation won’t be difficult for them. However, if you pick up cues that they are missing information, it may be a good time to advocate on their behalf. Understand whether or not your loved one is comfortable with you bringing up their hearing impairment around other people. If they don’t want you to mention it, respect that. Strategize with your loved one to find good ways to keep them in the loop and use those strategies when you are out in public. If you are unsure of how to be a good advocate in a given situation, opt for methods that include your loved one’s participation rather than try to “work around” them. The simplest ways of making a conversation more accessible to someone with hearing loss are lessening background noises and speaking with more volume. If your friend or family member has a strategy they prefer, recommend that to the conversation. Some new options may be available for opening up a conversation. Many modern hearing aids can stream audio from a smart phone directly to the ear canal eliminating interfering noise. Automated captioning and speech transcribing apps have also increased their viability in the past several years. If you know your loved one has the technology to utilize these innovations, make it a regular part of your conversations with them to make hearing easier. Advocacy isn’t about apologizing for someone’s disability, it is about eliminating stigma and increasing access. If you are with your loved one when they are getting important information- like a medical appointment or legal counsel- you can be an advocate by being an extra set of ears. Make sure your loved one gets vital information in writing, and go over it with them to make sure they didn’t miss things that were spoken. If you or someone close to you has noticed a change in their hearing, it’s time to set up a hearing exam with Elite Hearing. With our hearing expertise and our wide selection of hearing aids from trusted brands, finding answers to all your hearing questions is easy.